Click on My Sites at the top menu of Etudes to access all of your sites. 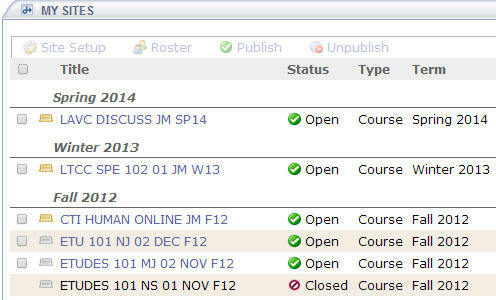 Your courses will be listed by term, with the most recent ones first. Development sites are at the end of the list. You can also see what courses are available in the archives. The list of archived courses is included at the bottom. You can’t access archives. But, you can import their content into a class, using “Import from Site“. 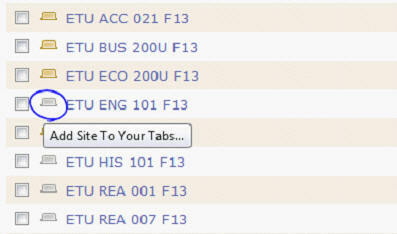 From My Sites, you can see the status of all of your classes (i.e. if they are open or closed, if they have open or close dates, and when they were created). At the start or the end of the term, you can come to My Sites, select which courses you want to open or close, and do that in a couple of clicks. 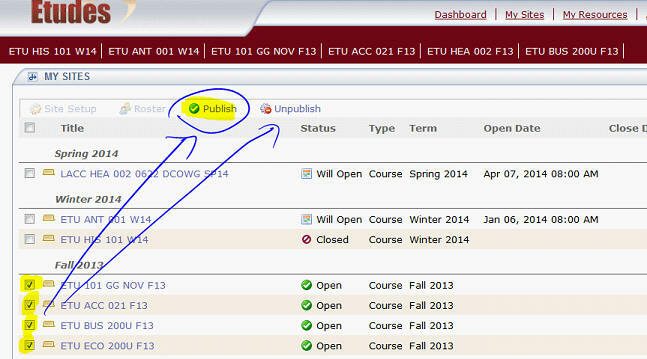 Check the sites to select them, and click on Publish or Unpublish to perform these functions. From My Sites, you can add or remove a site from your tabs quickly. Sites with an orange tab icon in front of the title mean that it’s in your tabs. To remove a site from your tabs, click on the orange icon. It will be grayed out. To add a site to your tabs, click on the gray icon. It’ll be added and it’ll turn orange. Select a site and click on Roster to view the status of your enrollment, or select a site and click on Site Setup to prepare a site for a new term, change the skin or other options. 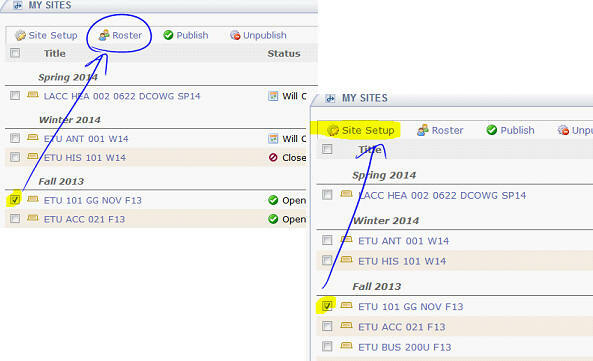 Once inside Site Setup or Roster, click on Next to navigate to the next class on the list.